The Northwest Seaport Alliance’s rail services offer long- and short-haul connections to serve a variety of our customer needs. 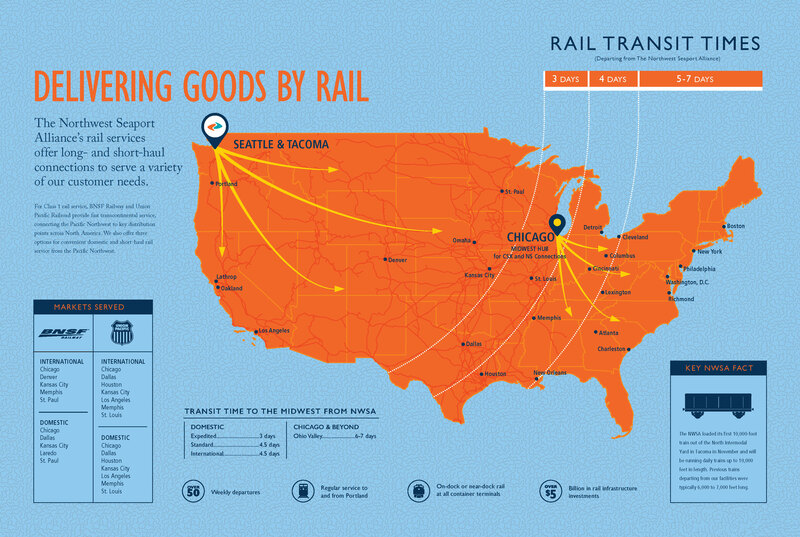 For Class 1 rail service, BNSF Railway and Union Pacific Railroad provide fast transcontinental service, connecting the Pacific Northwest to key distribution points across North America. We also offer three options for convenient domestic and short-haul rail service from the Pacific Northwest. Take a look in your closet. Open a dresser drawer. Chances are, something in your wardrobe — a T-shirt, polo, jacket, gym bag or backpack — is a SanMar product. The 14 containers form two, first-of-their-kind straddle carrier portals that streamline the process of scanning containers for radiation by 18 to 24 hours, said Mike Reilly, director of intermodal business development for The Northwest Seaport Alliance. When she was 4 years old, Capt. Sandra Bendixen stood on a dock in Alaska with her father and grandfather — both captains — and watched a ship maneuver into port. The sight was so impressive, Bendixen announced she would drive ships when she grew up. Growing up in Germany, Christine Wolf aspired to a career in agriculture, possibly working on agricultural policy issues for the United Nations or the European Union. Whether you like an IPA with a heavy, hoppy flavor or a stout with an earthy aroma, if it’s beer — then it has hops in it, according to Jaki Brophy, communications director for Yakima-based Hops Growers of America. In 2016, ships calling on The Northwest Seaport Alliance released 764 fewer tons of diesel exhaust into the air than they did five years before—enough pollution to outweigh three rubber-tired gantry cranes. Our Business Development team specializes in container, breakbulk and intermodal business and manages a large facet of the supply chain. They may be crisp, sweet or tart. Red, green or golden. But they’re always delicious. As competition within the shipping industry heats up, storage facilities at warehouses and distribution centers are playing an increasingly important role in moving cargo.